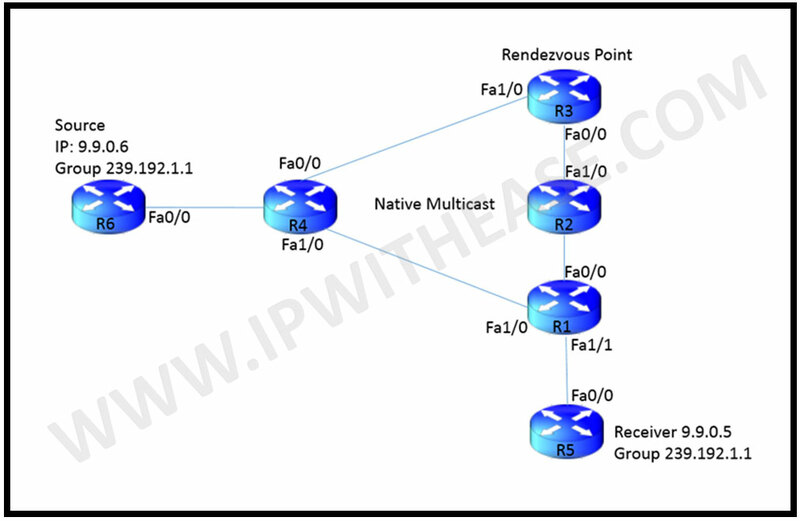 In this post we will use a simple topology and configure Native Multicast step by step and verify the results as well. Enable ‘ip multicast-routing’ on all routers in global mode. Enable IGP on all the routers an in our case we have enable OSPF process 1 on all routers and area is 0. Next we enable ‘ip pim sparse –mode’ on all interfaces of each router. Now we configure IGMP on R5’s loopback interface to act as receiver. We see router has also joined group 224.0.1.40 which is a default multicast group that each router joins to listen to RP discovery messages advertised by mapping agent.Mapping agent on other hand receives the announcement for RP-candidates on group address 224.0.1.39. Configure the RP as below using Cisco Proprietary Auto-RP which enables the RP to be discovered dynamically. As soon as Router R5 joins group 239.192.1.1 it sends IGMPV2 join message. This JOIN message is then forwarded towards the RP by each router and a (*,G) entry gets created on each router. R3 also has and entry in mroute table for (*,G). Important to note in R3’s output is that we have Incoming interface as Null as for (*,G) entry incoming interface always leads towards the RP.Contrary outgoing interface leads towards the receiver. Enable command ‘ip pim autorp listener’ on routers except RP to enable them to dynamically learn about RP. Once the Source information is received on the RP in REGISTER MESSAGE from first hop router, the RP sends a JOIN message towards the Source now and builds the Shortest path tree and then RP sends a REGISTER STOP message towards the source to complete registration process.